This easy Stuffed Shells Recipe is not only delicious, it’s loaded with heart healthy fiber and is just 8 Points for 4 stuffed shells! That’s right, for cheesy stuffed shells people. 8 Points is a pretty good bargain for that satisfying portion. Pair it with a 0 Points salad or some roasted veggies for a very filling meal without using up a lot of Weight Watchers Points. Filled with fresh spinach, mushrooms and herbs, it’s a great vegetarian casserole recipe that the whole family can enjoy! 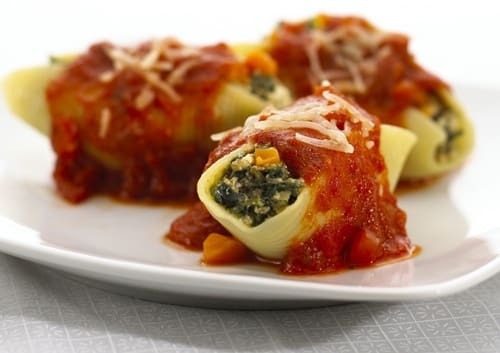 Indulge in a delicious Italian Stuffed Shells Recipe without breaking your Points bank. Loaded with all the flavors you’d expect, this dish is just 8 Points for four large stuffed shells. It’s the perfect healthy family dinner recipe! Cook shells until just tender, according to package directions. Drain and rinse under cold water. Set aside. Spray a large nonstick skillet with non-fat cooking spray and set over medium-high heat. Add onions and mushrooms and cook, stirring occasionally, until softened, about 3 minutes. Add spinach in batches and toss with tongs until wilted. Drain in a colander, pressing out excess moisture with the back of a spoon. Let cool. Set aside. Combine ricotta, basil, oregano, garlic, breadcrumbs, 1/4 cup Parmesan and nutmeg in a bowl; mix well. Add the reserved spinach and mushroom mixture and season with salt and pepper. Stir in egg white. Stuff each of the reserved shells with a generous 2 tablespoons of the ricotta mixture. Spread 1 cup marinara sauce in the bottom of a 9-by-13-inch baking dish. Arrange the stuffed shells in a single layer. Top with the remaining 2 cups of the sauce and sprinkle with the remaining 1/4 cup Parmesan cheese. Bake until the top is golden and the shells are heated through, about 30 minutes. Let cool for 10 minutes before serving. Here’s my take on the dish. That’s a lot of spinach, but it does really shrink down once it’s cooked. Still that’s about 1/3 lb. of spinach per serving. It was too much for our taste. All three of us had to force some bites down. If I make it again, I’ll double the mushrooms and halve the spinach and keep everything else the same. I know we’ll miss out on the vitamins from the spinach, but I’d rather have less filling and have it taste better. Prep time was way more than 15 minutes. I’m including the shredding the parmesan, cooking the shells, chopping fresh basil, mixing it all together, and stuffing the shells, but I’d put the time at close to 40 minutes w/o cleanup. I made this and had some of the filling left over and it was so great in an omelette! My sister and I decided to make a dish for a church gathering we were hosting and decided on this recipe. We wanted to have a lot of little finger foods they could eat throughout the day and these were very popular as they were the first dish gone! It was a fairly simple recipe and I would really recommend it to anyone! I just copy and paste to office and then print….. I can never find the print button, is there one?